Hi Guys, most of the person must have to use different companies Android Smartphone. When you bring any latest technology Android Smartphone you have lot of excitement about the features of your Android Smartphone. Lot of time when you have a tight schedule there are lot of interruptions are made by your phone calls. Due to which you will not able to concentrate on your important work. Today we have to discuss an important tip how to turn on Do Not Disturb and Priority Interruption on incoming calls and messages. Most of the person disturb when they received random call, alerts messages, notification etc. You will be not able to properly focus on your work. Sometimes you will get different incoming calls and messages from the different company for getting information of offers. Due to avoid these unusual incoming calls and messages most of the person activate Do Not Disturb facility in his phone. But when some persons regularly calls you lot of time and you don’t want to pick the calls. In that situation you have to turn on Do Not Disturb and Priority Interruption on incoming calls and messages. Do Not Disturb features allows you to put your phone in silent mode, if you received and calls or messages then there is no ring play on your Android. But in that situation you also lost few important calls, so i don’t think Do Not Disturb features is useful for you. 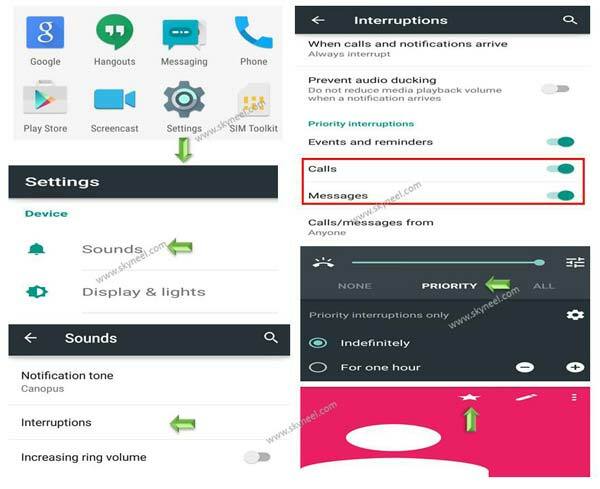 If you want, your Android ringing when you received any call or messages from selected persons then you can use priority mode features in your phone. In that feature you will select one or more person in your priority list and when you received calls or messages from these person your phone will be ringing. Rest of the person calls you or sending any messages on your phone then it will be silent and you will not be disturbed from your important job. Have a look how to turn on Do Not Disturb and priority interruption on your Smartphone. Step 1: Tap on the “Settings” option on your Android phone. Step 3: Scroll down and tap on the “”Interruptions” option, then check the Calls and Messages switches are toggled on. By default both of them are turn off, turn on both these options. Step 4: Next, tap on the “Calls/Messages from” option and choose the “Starred contacts only” option. Step 5: Now, go through the Contacts and select the required contact and tap on the star only those contacts who really, truly related to you. Step 6: To enable Priority mode, click the volume button on your phone and tap on the Priority from the volume slider list. To turn on Do Not Disturb on your Android phone then tap on the Settings > Choose Sound and notification / Sounds option > Turn on Interruptions > Now, tap on the When calls and notifications arrive > Now, turn on the Don’t interrupt option at the place of Always interrupt option. Step 1: Tap on the “Settings” option on your iOS. Step 2: Tap on the “Do Not Disturb” option. Step 3: Tap on the “Allow Calls From” option, and then pick the “Favorites” setting. Once you do, if you received and calls and text messages from those which is added in on your iOS Favorites list they will ring, even with turn on Do Not Disturb mode. Note: You can also choose any specific contact or group of contacts from your contact list for the Allow Calls from setting option. Open the Contacts app on the Mac desktop, then tap on the File > New Group to get started. I hope you like this article. After reading this article you will be able how to turn on Do Not Disturb and Priority Interruption on your Android and iOS. Kindly share your knowledge with your friends, family members and others and give important suggestions in the comment box. Thanks to all.